Hi guys! As I told you last week I've been really making use of my new Bundle Monster plates. 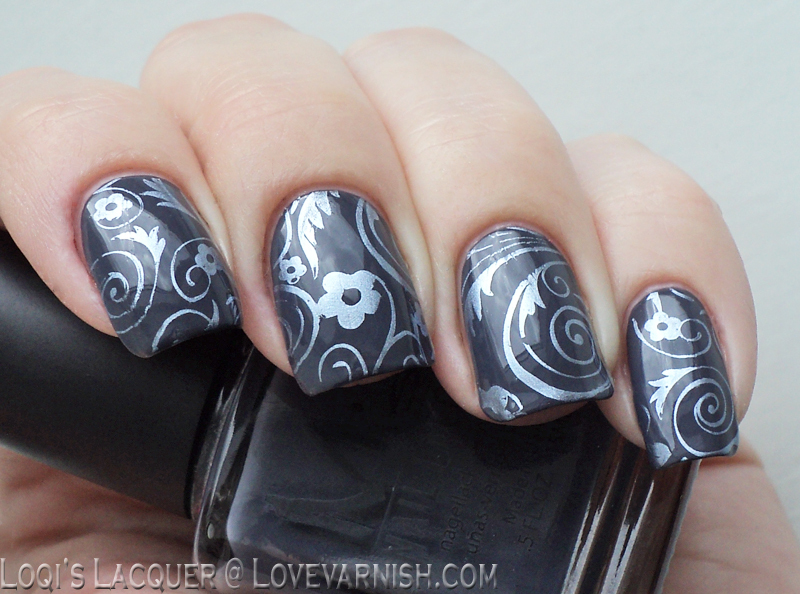 So today I've got another stamping manicure for you! As last week's manicure was a girly pink one, I thought it would be nice to show you a darker one today! For the base of this manicure I used one of my all time favourite polishes: Misa Office polish-tics. It's a muted grey blue crème polish, that applies like a dream. For the stamping I used Kiko 623 Blue, an ice blue metallic polish that I thought would give a nice contrast with the muted blue base. The image I used is from BM plate 719. 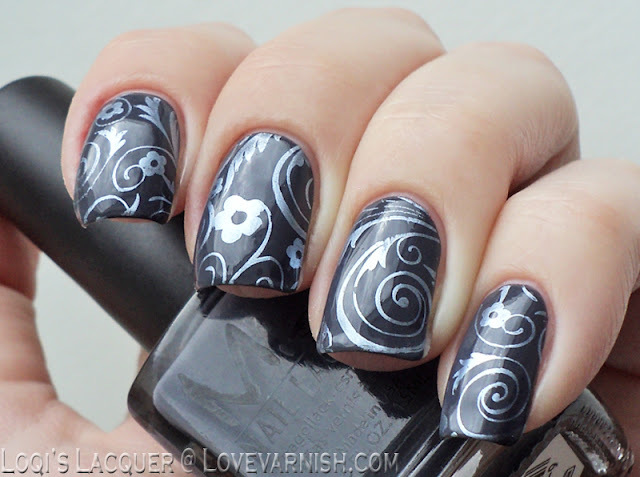 I picked an image that wasn't too dense because I wanted to keep this manicure quite dark with some brighter accents. I really like how it turned out! These are really nice! 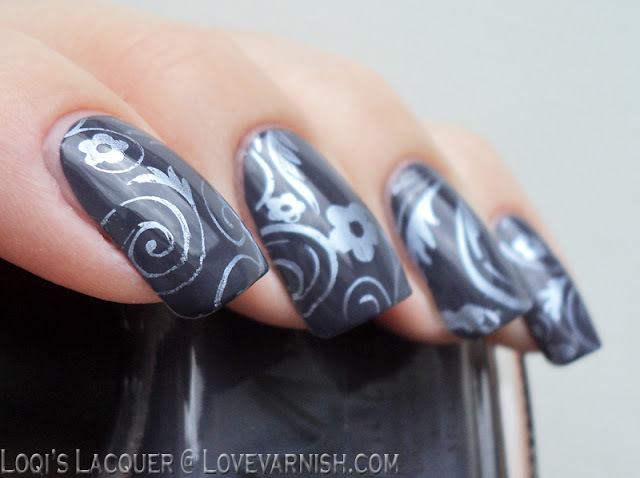 I myself prefer the darker manis so I think this is one of my favs with your stamping manis so far! The combo of colours and design is magnificent! I really like how the chrome looks stamped. It came out great! These are awesome! I love that dark base! That blue metallic is the perfect contrast with the creme base! Gorgeous! I love that you used the metallic finish with the creme. Great job! Great pairing for these two! I love the simple elegance of this! The metallic paired with the creme makes this really striking! This is just lovely! I've been trying to play with those BM plates this week too and I have some things planned with them. They are really beautiful plates, but it's hard to figure out what to do with some of the designs (at least TO ME it is). I love that dark grey Misa polish. It's gorgeous! The stamping is a lovely compliment to it. Beautiful! Simple yet stunning. 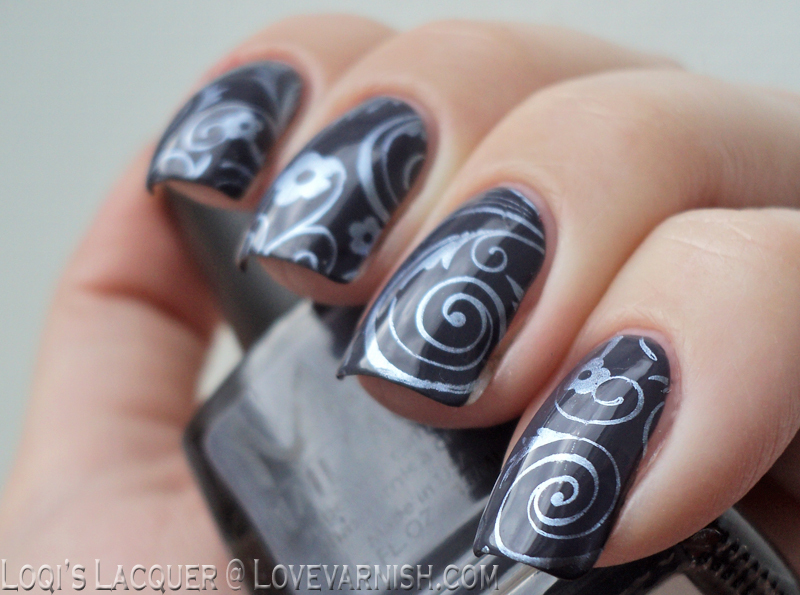 You always have some of the best stamping. This is simple but oh so pretty!